Mamma Andersson, The Lonely Ones, 2008. Oil on panel in two parts, overall 50½ x 120 cm. But Andersson takes this process a step or two further, importing images of stacks of books and stray photographs, clipped from various sources, directly into her painted compositions. 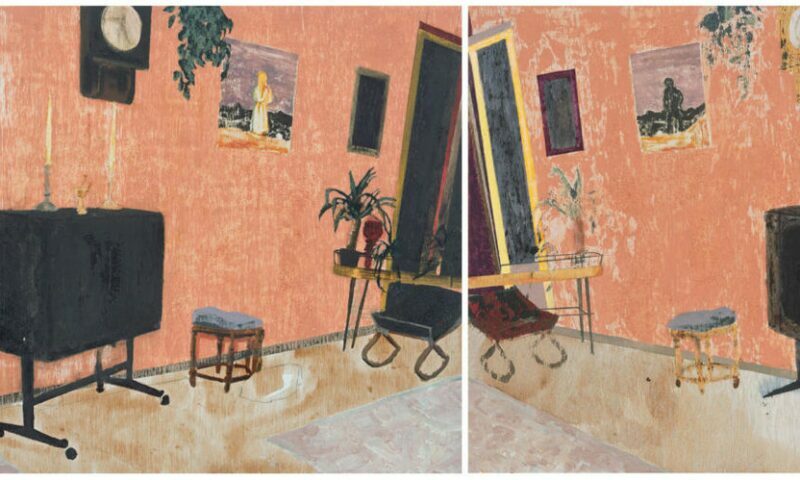 With careful observation, Andersson’s dreamy landscapes and interiors (often combined) slowly come to reveal common imagery and accumulated biblio-ephemera filtered through, and sharing space with, the artist’s muted palette, melancholic scenery, and textural paint. Mamma Andersson: Memory Banksfocuses on this aspect of Andersson’s painting practice, exploring how her use of appropriated imagery and collaged elements charges her paintings with an eerie, uncanny sense of familiarity while indulging in wholehearted fantasy and suggestive narrative.